Dubai: The chairman of Emirates airline and Group on Wednesday dismissed speculations about a possible merger with Etihad Airways, saying that owners of the two airlines have not talked about a merger. 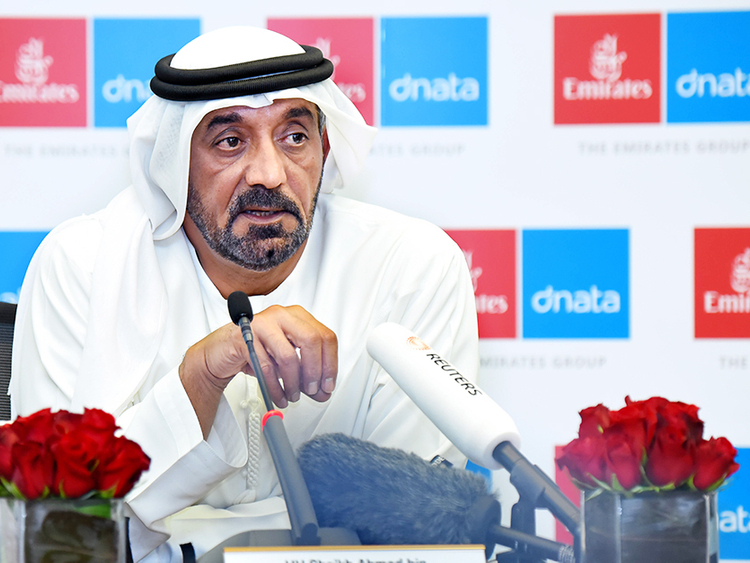 Shaikh Ahmad Bin Saeed Al Maktoum, President of Dubai Civil Aviation and Chairman and CEO of Emirates Airline and Group, however, said that Emirates is interested in further cooperation with Etihad. “I don’t think the government in any way or shape between Abu Dhabi or Dubai has talked about a merger. But we can always do things together, in terms of buying things together, using our facilities together within the UAE but also abroad,” he said. Emirates Group Security and Etihad Aviation Group in January signed a deal to cooperate in aviation security, the first deal between the two companies. Emirates said at the time that the agreement signals the importance of collaboration on security, but the deal fuelled speculation that the two aviation companies might merge, especially with Etihad currently undergoing a review of its strategy. Spokespeople from Emirates and Etihad have since then said the companies are interested in boosting cooperation. Last week, Tony Douglas, chief executive officer of Etihad Group, said the company will “consider where appropriate” other areas of partnerships with Emirates. He did not elaborate on what those areas may be.